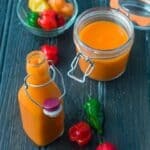 Scotch bonnet pepper sauce recipe – Learn how to make your very own homemade flaming hot pepper sauce that’s great for meat or a even side serving condiment. 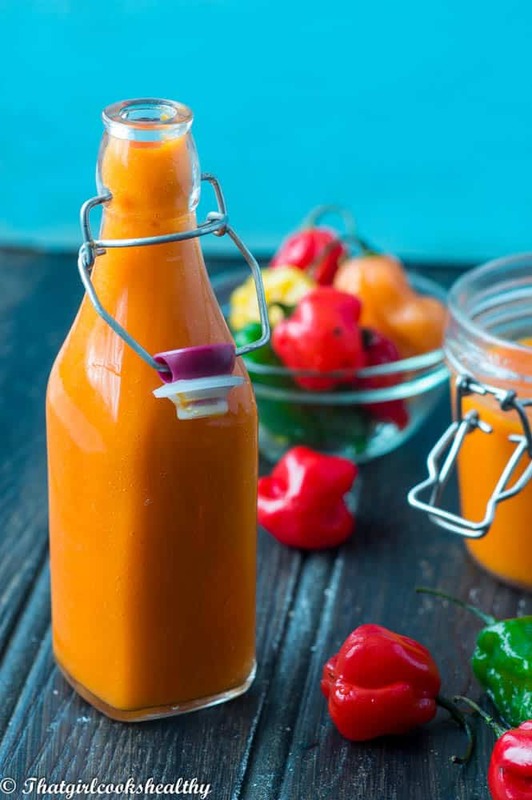 This condiment is every heat seekers dream come true because the flavours from this scotch bonnet pepper sauce are bold and the level of heat is just mind blowing. The entire recipe is made from scratch, homemade using only fresh ingredients. 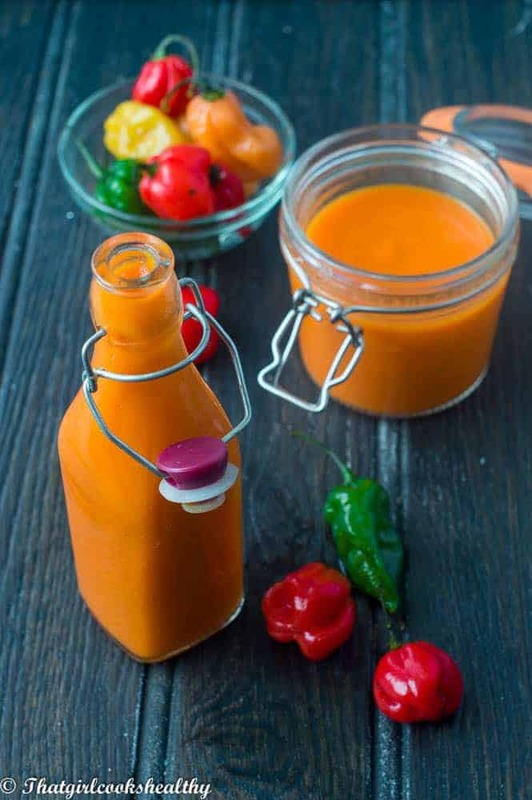 pepper sauce would make a great dip or simply use on some poultry or seafood. I love hot sauce, believe me I really do, it’s in my DNA so it’s about to go down. Prior to my blogging days I would venture off to the supermarket and pick up a bottle or two. The first thing I would do is scan the back of the bottle for the list of ingredients. I knew exactly what I was looking for and that was the vinegar, I don’t like hot sauce that has that strong pungent vinegar taste. Sometimes I would hate it when I saw a bottle of hot sauce, scoop it up, only to find one of the main ingredients was vinegar. What is a scotch bonnet pepper? In short, a scotch bonnet pepper sometimes known as Caribbean pepper is a variety of chilli pepper that is native to Africa, the Caribbean and Latin America. The heat level is hotter than a jalapeno and the bonnet peppers vary in colour from orange, green, red to even bright yellow. They are used in Caribbean dishes to form a part of a marinade or used as a condiment/dipping sauce. 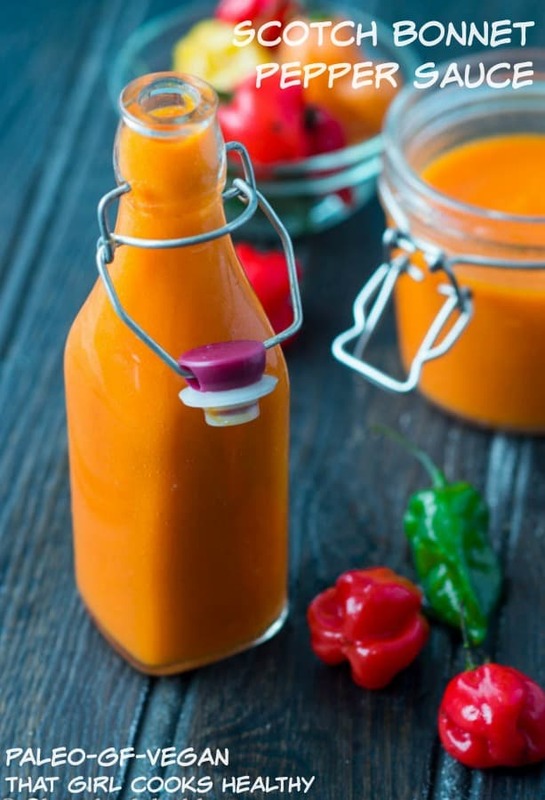 Many people often compare scotch bonnet peppers to the habanero peppers. Although they do bear a striking resemblance in respect to the thin waxy skin, the pungency varies depending on cultivation. Where Can I buy scotch bonnet peppers? The most obvious place to source them would be a market place that sells African/Latin/Caribbean food produce. I can purchase a large quantity for dirt cheap because I live in a neighbourhood with high African Caribbean demographics. Most supermarkets in the UK such a Asda, Tesco, Co-op have now begun to stock scotch bonnet peppers. I find the supermarket to be more expensive with a small quantity sold per bag. If possible do try to get them from your local market place instead. Adjusting the heat level – I used 8 whole scotch bonnets including the membrane to complete this recipe. That yields a very very hot, pungent sauce. If you don’t care for extreme heat then I suggest discarding the membrane/seeds and adjust the heat according to taste. Two scotch bonnets is mild, so the more you add the hotter the sauce so keep that in mind. Handling the scotch bonnet – Needless to say it’s advised to wear gloves while handling the scotch bonnet peppers. In fear of rubbing your eyes while in direct contact with the pepper. Pureeing the ingredients – I started the recipe by pureeing the each ingredient separately, use a little water to help the pureeing process along the way if required. Pureeing can be done in either a food processor or a blender, both work fine. Cooking the pureed mix – You want to combine all of the ingredients in a skillet and simmer for about 20 minutes. This is to allow the flavours to come through and deepen, make sure you follow this step as it really makes a difference to the resulting flavour. 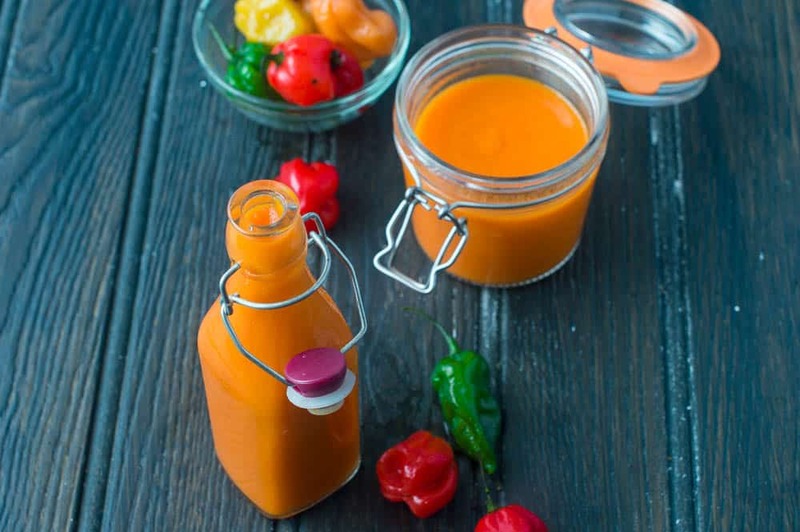 Preservation – since no vinegar is used to preserve the hot sauce I used lime juice instead. Lime juice behaves in a less acidic way to vinegar and this should help to keep the sauce for awhile. 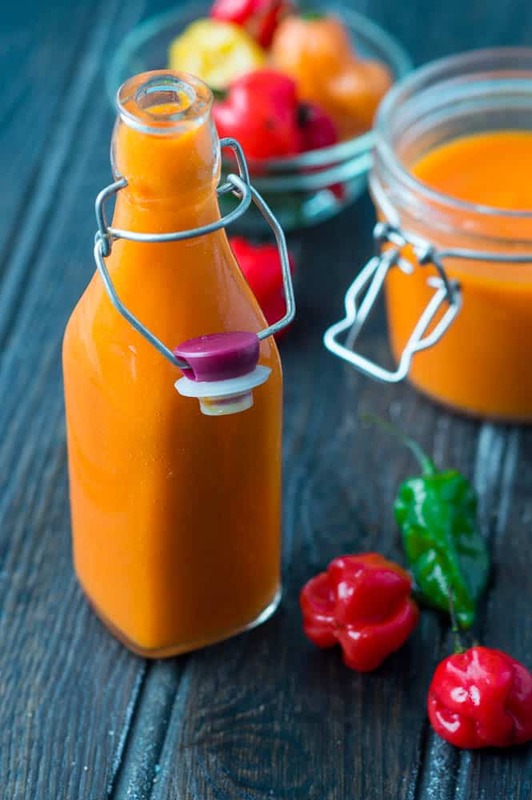 Storage – Use mason jar and/bottle jars to house the sauce and keep chilled in the refrigerator at all times. Can I use another pepper like habanero/jalapeno if I can’t find scotch bonnet? Yes, of course. habanero peppers are probably the best replica in my opinion. How long does the pepper sauce last when refrigerated? Follow on by pureeing the carrots, bell peppers and scotch bonnet peppers. Add the coconut sugar to the pureed vegetables and stir. Add the pink salt and juice of a lime to the pureed vegetables, cover and simmer for 20 minutes. Check out these amazing black history month recipes……………….